The list of athletes that the mainstream media has covered going broke over the last couple of decades always seems to chalk up a couple of new victims each year. It doesn’t come as any surprise that just because you are 7 feet tall and highly proficient dunking a basketball that you don't automatically understand how to manage your money. 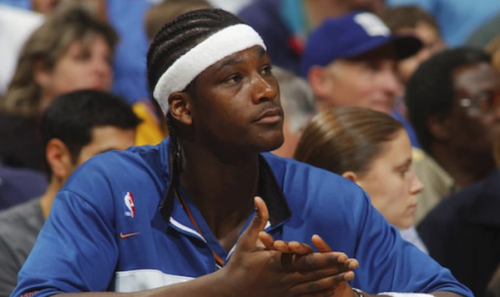 The latest victim of either his own actions or a corrupt investment banking system - it remains to be seen - was Kwame Brown, the first overall pick in the 2001 NBA draft, who went on to play for 7 different NBA teams. The fact that Brown alleges that his signature was forged on documents changes this story from a "mismanaged money" story to a "possible full on fraud" story. How did Brown find out about this mismanagement? He made a routine request for a list of his investments with Merrill Lynch and instead of being told about the fixed income his $17.4 million was making him in ETFs, he was simply told that he didn't have any money at all with Merrill Lynch. Official documents show that Brown is suing Merrill Lynch, Bank of America, and his financial advisor Michelle Marquez. He claims to have been a client from 2004 and 2017 during which time she handled his income from playing in the NBA, as well as invested and traded stocked under his consent. The problem is that Marquez was allegedly trading and investing Brown's money into various stocks and projects without being granted permission from the former center. Brown also alleges that Marquez opened various bank accounts under his name as well where she would deposit the money for investing purposes. In one specific instance cited, Brown even learned in 2015 that a $1.1 million loan he instructed Marquez to pay in 2006 had never been paid off. Eventually, Brown was unable to get into contact with her and claims his signature was forged on documents that would lead to his accounts with Merrill Lynch and Bank of America being depleted. The lawsuit is seeking the return of Brown's $17.4 million along with further damages. Kwame is just the latest in a long line of actors and entertainers and sports figures who either go belly up trying to manage their own money - or who are duped by those "in the know" in the industry who take liberties with clients who don't understand how the financial system works. Yet, when "Real Estate and Bitcoin Expos" roll out celebrities like Alex Rodriguez and financial heavyweights like Pitbull - who was at one point on CNBC pumping Bitcoin around $20,000 - they have no problem filling seats. Go figure.